3. mobs should float outside fence/block, then teleport back in when you get close. 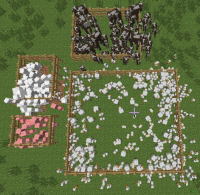 MC-84966 Mobs "trespassing" fences and blocks. MC-210 Animals Are glitching through doors! MC-1197 Cows push themselves out of cobblestone walls. MC-2173 Animal glitching through cobblestone walls.